Fire TV is getting an update that bumps the software powering the set-top box up to version 51.1.4.0_user_514006420. This awkward string of letters and numbers will provide owners and guests alike with more ways to get enjoyment out of Amazon's little black box. This update gives the Fire TV the ability to run tablet-style games using an Amazon Fire Bluetooth controller. The modified game controls significantly expand the amount of content available to the platform. The Fire TV now lets guest users mirror content from their Fire phones, tablets, or Android devices running Android 4.2 or higher. They no longer need to be registered to the same Amazon account to take advantage of the feature. Amazon is also using this time to let people take their Fire TVs with them when they travel to another country for an extended period of time. Though, there's a pretty big caveat. This only works if you're going from the US to the UK or vice versa. So yes, you can literally take the device to another country, and only that one. Play tablet games on Amazon Fire TV: You can now play tablet-style games on your Amazon Fire TV with an Amazon Fire Game Controller. 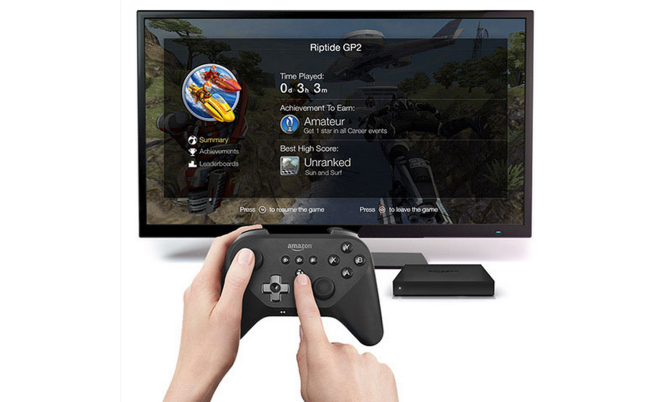 Modified game controls allow for a much larger selection of games on Amazon Fire TV. To learn more, go to Play Games & Apps. Guest Display Mirroring: Friends and family can now use their Fire phone, Fire HDX tablet, or Android device running 4.2 (Jelly Bean) or higher to display their screen and audio on Amazon Fire TV. The device doesn't have to be registered to the same Amazon account as the Amazon Fire TV. To learn more, go toUse Amazon Fire TV as a Display Mirroring Destination.